I'm working on a new line of paper toys! The skies are full of danger, as a new breed of heroes tests their meddle in flying machines. Old tactics and new technologies combine during the Solid State War, a war that will decide the fate of the planet. Which side will you choose -- the powerful State, or the wily Rebels? 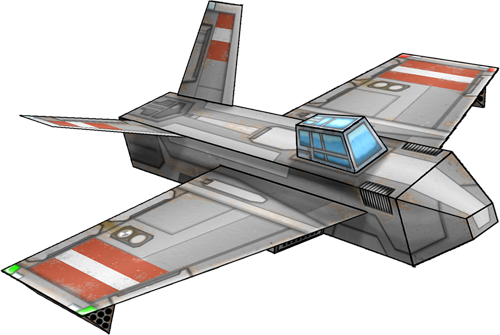 I'm currently texturing 4 futuristic (but kinda retro) jet fighters, the first releases for the SOLID STATE WAR toy line. These include 2 of the State's mainstay fighters, and 2 of the Rebels' hit-and-run raiders. Each plane will offer a selection of squadron liveries, as well as "captured" paint schemes and neutral schemes for commercial traders. hmmmm... Ok, you got me interested. I really wanna see these. This sounds intriguing. Might work well for a Dieselpunk game with anime overtones. Have you seen Last Exile? I haven't followed the whole series, but there are some really cool elements. Castle in the sky and Nausicaa are also great futuristic but retro jet movies as well. Might have to get the Zeppelin troopers for this. Well, there's also Orcs and low-tech stuff like that! I for one don't think ALL vehicles need to look "shiny." Old and modified is BETTER in my opinion! Well, these probably won't get a lot of use with games. They're really designed to be toys. 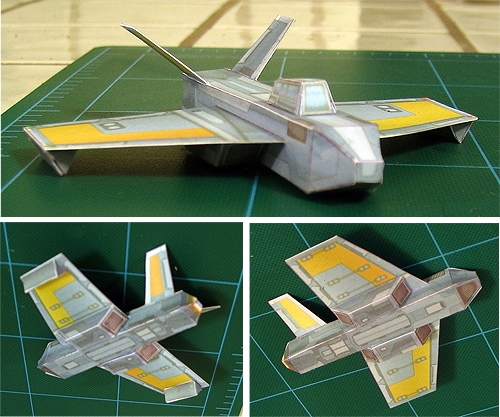 Quick, fun, smooshable paper jets for kids of the action figure-playing age. They're designed at a small scale for small hands (about 7.5mm but I'm not saying exactly). They exist in their own universe, and will have unique markings that place them in that universe. But the look is going to be a little dieselpunk with a bit of Veritech. That's my starting point. I've only laid out the basic colors and shading on my models, so there are almost no details yet, and no panelization. I can still go a lot of different ways, but we'll see what looks best as we go along. I've never tried anything like this before, so it's an experiment! If these toys get any sort of following, I'll design bombers and other aircraft, ground vehicles and buildings, ships and carriers. Gotta start somewhere. Here's a paper test for one of my new jets. There's still a lot of texturing left to do, and this color scheme might not appear on the final model, but I think it's coming along. Are those one inch squares on the cutting mat? Just wondering for size reference. Looking forward to seeing these released. I think that these MAY be the perfect scale for Jaeger's Paper War Mech figures! (I see a plan coming together)! The lines on my cutting mat are 2" apart. That jet measures 3.75" nose to tail, with a wingspan of just over 4". In shape, this is the most "normal" looking jet that I've designed so far. I borrowed heavily from Korean War era MiGs and Corsairs to design this one. It's actually a Rebel craft (which would normally come with a brown paint job) so this one must have been painted blue to try to fool State patrols. Style wise, I definitely ended up with more Veritech than dieselpunk, but there's still room for piping and grease streaks. These look great, as your stuff always does! I would have to say that I can see my son playing with these! (I think I see your inspiration... "I will make you YOUR models, so you will leave mine alone")! I'm thinking the same thing. If you can make them 15mm scale, you can get people from two markets. The toy market and 15mm gamers. These could almost work for 10mm scale. They're a bit smaller than that, though. While these may not be ideal for games, I might take a look at 15mm stuff and design aircraft models in that scale some time down the road. Suggest me some games! Well, I generally ONLY do the 25-30mm gaming (which from what I can tell is the standard gaming scale, followed closely by 15mm). There are spaceships and starfighters (which I REALLY love), but what about things like Glenn's Manatee that isn't a space dropship, but more of a water vessel? I am thinking of a craft that can transport a vehicle across water... (thinking the invasion of Normandy-style vessels). I for one would like to see some vintage style aircraft that would have dirt, rust and grit on them like they have seen some action. Down and dirty dog-fighters that have machine guns mounted in the wings, and pilots that chew leather for fun. I am not asking for "historically accurate craft," but something that you look at and think, I could see those flying over Germany or England 65 years ago. I guess I am at the point where I have put together SO many spaceships, that a Japanese Zero really sounds good. Now, I am also thinking that one of these could be INCREDIBLY difficult to build (let alone, design), but if you took the basic concepts of the fighters you have designed here (bringing the topic back to port), you could simply scale it up a bit, and throw some dirty skins on it, and it COULD fit the bill beautifully! ONE of my FAVORITE aspects of your work is the detail, the layered PDF's (so you can treat it like a plastic model, and "paint" it to match your army or make it look different if you have several on the table at once), and the "easy" build level. I would rather build 10 models that look nice, then spend a week on one and have it look phenomenal! (Good thing with your work is I can build one of yours in an hour or two, and it DOES look phenomenal)! I would like to see fighters, and I feel with this request, you could perhaps even tie them into your buildings that look like they are from WWI or II! They don't have to be historically perfect, but an easy model could have more appeal than a "major project, Level: Professional, EXPERT MODELER level..."
Ok... most people won't even bother reading this, and I am sorry for all of the "blah, blah, blah..." in this, but you DID ask..
Yeah, I'd like to do something like that for these little jets, like nice big flat-topped carrier with tanks stored under the jetway. Maybe a little door flap/ramp to deploy them, haha. I'm not terribly interested in designing models for historical aircraft. I've done textures for WWI and WWII aircraft -- which I love -- but there are plenty of historical models available, at just about any level of detail you want. I'm hoping to find some niches that aren't so crowded. Crimson Skies pretty well covered the steampunk look for WWI - WWII aircraft. There's a lot of great stuff there, but I wouldn't want to get too close to it. I borrowed heavily from Korean War era MiGs and Corsairs to design this one. It's actually a Rebel craft (which would normally come with a brown paint job) so this one must have been painted blue to try to fool State patrols. They look like fun, no idea what game system they'd go with though. Grunts is a generic 15mm game system. I'm not sure if it covers air units? Here is a list of others, but I don't know the scales. Hey Dave, It wouldn't take much to open that cockpit up and make it big enough to fit a 28+ figure or two. There are no cows in space. Final advert graphics for the Tigress. Here it is in the livery of the wing commander of an elite Rebel unit. If there's no game system, why don't we make one? I've thought a little bit about how to design a game around these, and might get serious about it once I get a few models together. I've got some kooky ideas, like providing each jet with its own turning key and printable attack die with customized facings. I like the idea of including everything needed for play in an easily printed format. I'll keep kicking around some ideas and start posting prototypes. EDIT: In all honesty, I had thought about game-izing these models around the same time I started designing them. I didn't want to jump into that straight away because 1) it's not as fun as just designing toys and 2) a game is something I can release later as a stand-alone thing. These are to cool not to have their own game. Maybe borrow the idea of hard points on the wings for guns and missiles, add abit of customization. I remember some Transformers toys coming with ratings like these, and I loved them. I'm planning to include something like this with my jets. The Walking Papercut walks again! Relyability looks interesting - what does it represent? The chance of the plane not reacing its destination, failure in the sweapons systems, loss in any of the other stats? Overall I like your design, although I don't know about a dedicated gaming system - I'm the wrong person to ask, though, since we don't have time (or the desire) to play anything beyond 4e (or to rephrase it in a more diplomatic way, we feel we only have time for one system, and 4e happens to be the one we dug into. Lazyness and the lack of a system that is way superior is keeping us in it.) Anyway, I'm looking forward to seeing the final (and the other) designs. It could mean the chance of someting breaking down in case armor is penetrated. Armor - simple enough: the more armor the harder it is to damage this plane. Acceleration - allowed change in speed during a game turn. Operating Range - i only see the need for a stat like this in some sort of campaign or grander scale strategic game where distances from base to the combat zone are important. Whether or not you are using these stats (or ratings) or inventing some of your own is up to you of course. But i think there are a few missing, like Climb Rate, Ceiling, and number of hardpoints. The biggest problem i see in designing an air combat game is that air combat is in 3 dimensions, which might be difficult to handle decently. I wish ALL models came with this set of stats! 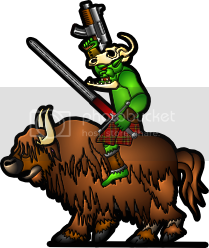 (Along with weapon stats: Range, Damage, adn so forth). Would make it VERY nice! G.I. Joe action figures used to come with a little clip-out character profile. I really, really liked that stuff. 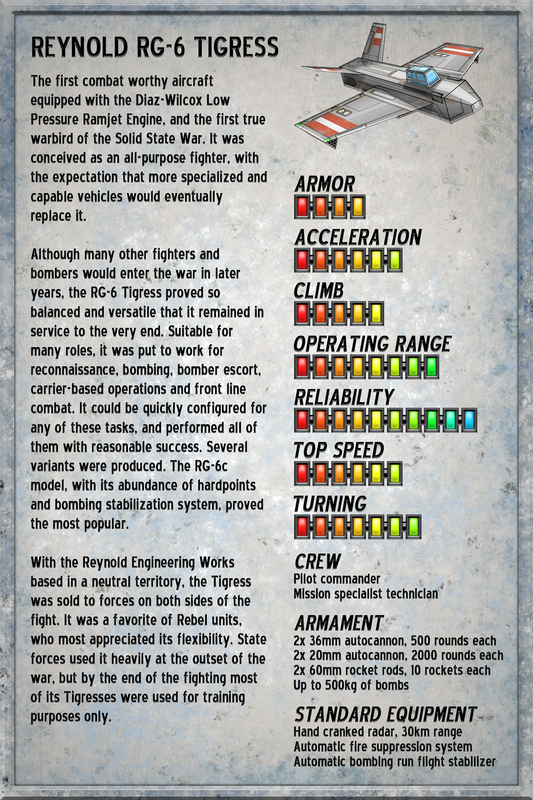 Right now I'm writing up a profile for the Tigress, along with the vital statistics, a list of armaments and other gear. I'll post it up here when it's ready, and see what you think. Still no game stats, but here's my first stab at a complete profile.